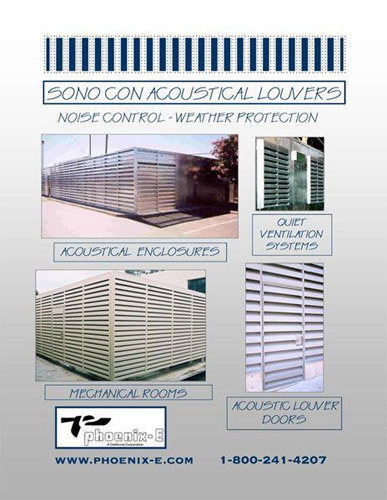 SonoCon acoustical louvers are fabricated in various assembly depths to match the sound attenuation requirements. These are typically installed in the building walls to reduce the noise transmitted through the ventilation openings needed for mechanical equipment cooling or air distribution. 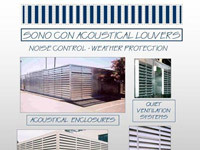 SonoCon louvers are easily installed in panelized or conventional construction and require little additional floor area. Requirements for aesthetic design, corrosion resistance, pressure drop and insertion loss dictate the design of the acoustical louvers. Generally, acoustical louvers are either aluminum or galvanized steel with airfoil or parallel surfaces. Grilled, weather-resistant and storm-proof styles are available. Each is rated by independent laboratory testing for both sound attenuation and aerodynamic performance. Pressure drop as a function of face velocity is provided in the performance tables to assist in quickly sizing the acoustical louver area needed to meet ventilation requirements. Aluminum, stainless steel and heavier gauge galvanized steels. Aluminum constructions can be anodized in any of the following : Clear #204-R1 or #215-R1 Bronze: Light, medium, dark or black. Flanged frames. 2" flange standard. Other sizes available. Galvanized screen : 1/2" x 1/2" x 19 gage is standard. Other sizes and materials can be supplied, including various expanded metal configurations. Thermal setting powder coating and Kynar finishes. Louvered doors with passage or locking hardware.